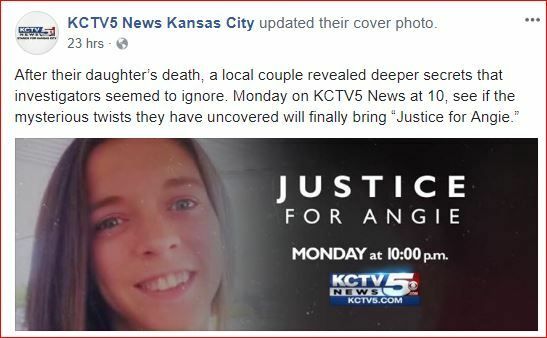 This is the story KCTV5 is doing on my daughter, Angie. It will air Monday, March 19th @ 10pm central time. You can watch it live on their app! KCJackie - if the KCTV5 puts up a video I'll try and post here. Maybe after Monday? Please go to KCTV5 and download their app and then you will be able to watch the full story in real time. I think she said it is a 10 - 12 minute segment. It will air Monday (March 19th) at 10pm CST. Hi, I need everyone’s help. My daughter was murdered in June in Independence, Mo by who we believe to be Donald R Greer. Any research on him would be appreciated. He had felonies on his records and now they have disappeared. Police said suicide, we hired our own Investigators that said it was a homicide. Police are covering something up. We were also told he died in December but nothing comes up he is deceased. I just saw this tonight and started looking around. How old is he or would he have been? Any other additional information about him you can add would be helpful in the process of elimination. Praying you find answers and peace. I'm so sorry. Found some older charges here in Baltimore Md. I did note a race difference in one record, thinking it was an error? Unless there was a white guy and black guy with the same name and birthdate living at the same address. There are more under Donald Robert Greer, same birth date in Md judicial records. Name is a little different here, but I did see a forgery charge. TY TexasMom!! He is white, he is supposedly dead but I'm not finding that in extensive searches that list deaths. Emily, the reporter said she was not going to touch on all points on Monday. There will be follow up stories and maybe a 30 minute special in May. It's like I've came full circle maybe it's time to start a thread on her? Your thoughts????? I'll be glad to start a thread for her if you want me to. My only reservation in doing so is that with the interviews etc. you wouldn't just be KCJackie here anymore. I definitely don't want to do anything that will cause you any more grief. Maybe check with Klaas and let her help make the decision? I'm so glad your story is getting out, we're standing beside you every step of the way! Jackie, I can't find anything on Greer. I have gone through Ancestry, FamilySearch, Newspapers. If he is dead he should show up somewhere with an obit. I am so sorry this has happened to you and your family. Your daughters picture shows a very beautiful girl. She was so young. I send to you my prayers and pray you find the answers on what happened to her. I will share that clip on FB as I do have some family in Missouri and maybe you can get it started on FB and Twitter. I've even used been verified.com and my daughter was listed as deceased before her funeral and he is not. My daughter got in to drugs after being raped by 2 guys that ruffled her at the age of 20 she was a virgin. Don was her drug supplier, I played the tough love for the last 6 months of her life - I wish I wouldn't have. Her toxicology came back clean. She was working and going to get back with her ex that we love to death and I just didn't know if I could believe her. I do not mind if a thread is started - all our stuff is already out there. You're welcome! I'm so sorry, so heartbreaking! You were doing what you thought best to help her, that's all we can do sometimes, as much as it hurts. I've searched and searched for an obit for him too, nothing. I'll start a thread this morning, may take me a little while, still on my first cup of coffee. My guess is he has changed his name-he is not deceased. He should have showed up in current newspapers if he was dead. I even did searches all over the US and nothing with that birth date or name. He should show up in Ancestry with a birth-heck even I am in the birth records. Do you know where is was born-was it Missouri? Or was he born somewhere else and only came to Missouri later on? Don't beat yourself up. No one is ever prepared for what lies ahead in a situation like this. The "if only" will eat you up alive. If Don was her supplier have you asked or checked with the FBI-they are really coming down hard on drug dealers. Maybe he is a target of the FBI. That's why I suggest he has changed his name, maybe even fled the area. Jackie Schroer Thankfully he is Dead - December 9th - confirmed by funeral home. Someone got the chair out, all of her belongings down to even toiletries. I think she was suppose to be next but police arrived. ::dogwag::hello monkeys, i was wondering if some one could help me retreave some photos I posted in the Haleigh Cummings case. back somewhere at the beginning I went to SatsumA and took photos of Ronald Cummings home and posted the in the thread some where, I have searched and searched Nd can't find them..........Please help!!!! Thanks Bearly! I sent her a link via email but I hadn't found this one! Good job! Do we have a thread yet on Maddox Ritch? or would someone start one please, I think there is a lot more to this story then is being told. Body found..... not identified yet. Sad. Page created in 6.254 seconds with 19 queries.